Be present, walk light, sketch easy. IIn the last couple of months I have been working on a special bag - the Sketchbag - designed for sketchers, illustrators, visual facilitators, field workers, explorers, curious souls. Gladly announcing that in 3 weeks time it is launching on Kickstarter!! We rush through many moments in our lives. The world goes fast, there’s a neverending to-do list in our heads. It is becoming a real challenge to slow down and be present in the moment. As an illustrator, anthropologist and sketcher I spend a lot of time on field - or as Urban Sketchers (link) put it: on location. To gather inspiration and material for a children’s book, to do field research, to talk to people. As a restless soul I spend a lot of time travelling. Each of these situations are invitations to slow down and observe. Sketching (link to FAQ) for me is a way of doing this. A way of being present. To stop, notice my breathing, look around. Arrive to presence. To sit down, open my sketchbook, and make sense of the world “one drawing at a time” - as said by the Manifesto of Urban Sketchers - a movement started 10 years ago by Gabi Campanario. To sketch is to say no to the rushing pace of modern life. Anyone can learn it, and it has the power to bring a renewed joy and serendipity to your everydays while walking your hometown, or walking distant lands.. I created Sketchbag to help you arrive into the moment. Into being present. And stay in it, take a rest in it - for the time of a sketch. I created Sketchbag to make sketching part of your life. To make sketching your way of life. Sketchbag is a small pouch you can wear on your hip, or on your shoulder. It is big enough to contain your essential sketching/drawing tools - up to 40 pens/pencils/markers, watercolour, brushes, water container, eraser etc. - at the same time it is so small and lightweight that you hardly notice wearing it. Its different sized pockets and loops offer organised space for your sketching tools - each one has its place, your hand can find them blindly. It is comfortable to wear - it actually becomes part of your clothing. What doesn’t fit in the bag you don’t really need. Be lightfooted, you don’t need to carry much. Sketchbag is a statement. A statement that you belong to the tribe of curious, aware souls. That you dare to slow down, observe deeply, see the world your way. That you can allow to come close with the city you explore, to become part of it. That you are more than a rushing tourist, you are there to understand, and see the layers beneath. Sketchbag prioritises simplicity and ease of access. I got to know Urban Sketchers in 2011. But sketching really became part of my life a few years later, when I was gathering material for a children’s book on Crete. It was one full week, covering many locations on quite a tight schedule. I was preparing to observe, watch, listen, collect (stones, flowers, sounds, smells, atmosphere), and obviously draw an awful lot. Very soon I got totally frustrated with my insufficient logistics… Each time while I was packing out my tools to draw, the subject was gone, the group was waiting for me, I had to move on. I have only sketched a fragment of what I wished to. That was the moment I made my first Sketchbag sewn by hand, using an old pillowcase, during an art festival in Italy. Then I proudly started to wear it and sketch along the festival. People kept stopping me and asking what it was, saying they liked that strange little thing hanging on my waist. I liked it, too - it hasn’t left me for much time ever since, accompanied me through 9 children’s book projects and across several countries, Rwanda, Chile, Brazil, Portugal, Tajikistan, Őrség. The best camera is the one that you have on you, accessible. If you have a camera on you, around your neck, you'll have a chance to take that photo that you just spotted. The best sketching tools are the ones that you have on you, and can take out without much hassle. Hassle makes you think twice, and you might not take the effort to take them out and sit and sketch. So ease of access, ready availability helps to MAKE that decision to stop and sketch. Since I created Sketchbag and my gear is always at hand, I tend to choose doing a quick sketch even if I only have 10 minutes. It is just one movement of hand to start, and another to put it away if I need to catch the train. While sketching helps me slow down, I must be quick to draw what I see - as things move and change constantly. Sometimes a subject is only there for a matter of moments. It is also often quite helpful to be invisible - to draw without much conspicion. Sketchbag CS helps you fully focus on your sketching/drawing. After a careful iteration process - 12 urban sketchers around the world have been testing it - Sketchbag CS is in the last stretch to be born as a product available for purchase. Shop opening early May 2019! I am very excited about it - I really hope it will be a product that indeed improves sketching/drawing experience for many people! If you (unlike me) are strong on social media presence and feel it is worthwhile for this bag to get out there - I am ever grateful for your help in reaching those whom this bag was made for. 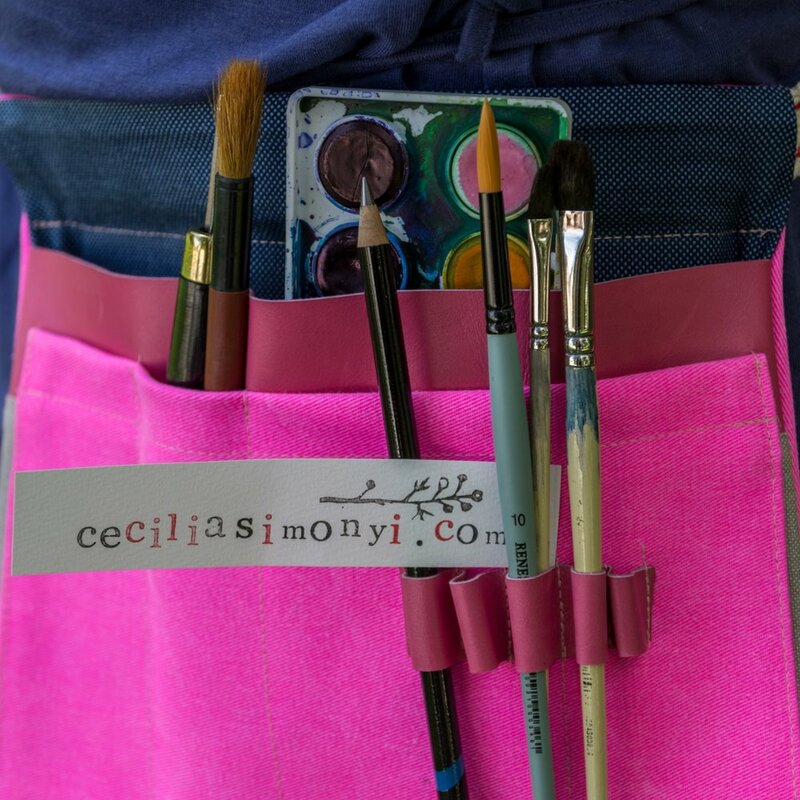 Sign up here to become an ambassador of Sketchbag CS. Your contribution will be appreciated and honoured.